Welcome to the Book Club dear reader! Thank you and I am so happy that you are here. This is going to be fun! I have recently become a huge lover of books, reading and self development. Being a fairly new mom with a baby at home, I find myself hunkered down at the house more… and while baby naps looking for something a little bit more life-giving than doing the dishes. There is no greater joy than sharing what you have learned with someone else and discussing a book you’ve read together. I also believe that when you are able to reflect on, share and discuss “take aways” from books with others it sinks in and you are able to really apply it to your life. 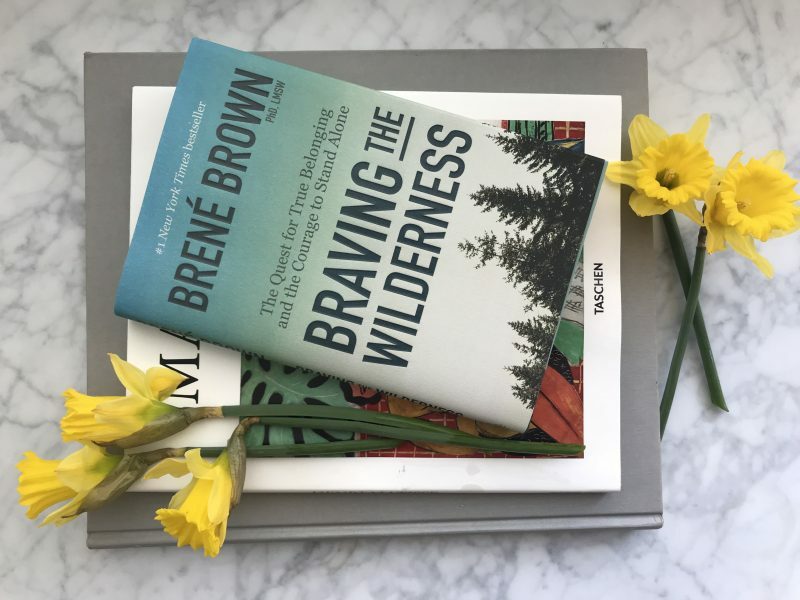 Without further adieu, I give you our very first Book Club read… ‘Braving the Wilderness’ by Brené Brown. 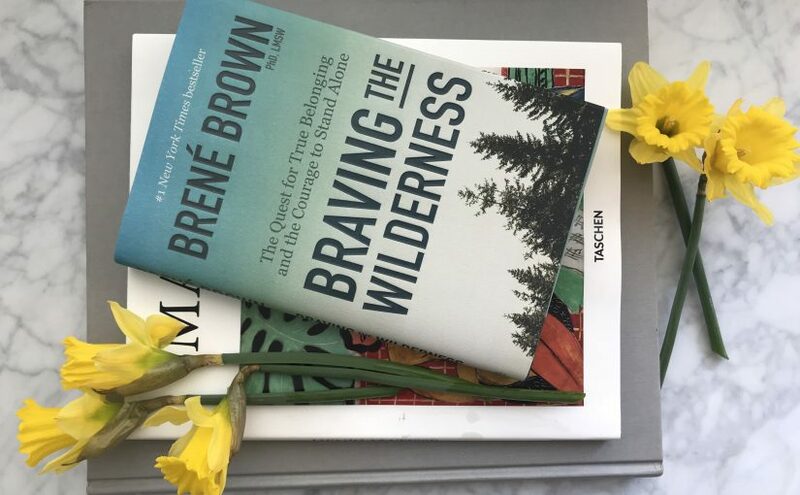 For the month of April we will be reading ‘Braving the Wilderness’ and will have a book discussion in a blog post comment section at the end of the month. Please subscribe to our newsletter to see when that post is live so you can join in the conversation. While you read the first part of the book here are some reflection questions to consider. Please feel free as you read and make it to about half way to respond to these reflection questions in the comments. My intention on this Book Club is to create a community in this space that goes beyond “social media” to real social engagement and connection. Please use this Book Club as an open space to discuss the book with respect for others opinions. I want to also remind you that this Book Club should never feel like a chore. This is created to be a life-giving activity and you should look forward to doing it and being a part of our discussion. If you need to read at a slower pace or participate by listening to the audio book – please do that! 1. How would you describe the difference between belonging and fitting in? Have you given this much thought before reading this book? …That fitting in and belonging might be different? 2. “There is nothing worse than not belonging at home.” How can you connect this to parenting and raising children? Or, How can you relate this to your childhood? 3. Brené Brown uses BRAVING as an outline for what it takes in order to trust others and in self trust. B – Boundaries, R – Reliability, A – Accountability, V – Vault (keeping confidences and not speaking out of turn), I – Integrity, N – Non-judgement (ask for what you need and accept what others need without judging them), G – Generosity (not jumping to negative assumptions about the intention of others) Which of these characteristics do you feel like comes naturally to you, and what do you struggle with? 4. “Spirituality is recognizing and celebrating that we are all inextricably connected to each other by a power greater than all of us, and that our connection to that power and to one another is grounded in love and compassion. Practicing spirituality brings a sense of perspective, meaning and purpose to our lives.” What do you currently do in your life that is a spiritual practice that connects you to all things? 5. She talks about the paradox of belonging, vulnerability and connection in the book. How it is important to be brave and stand alone when you are called to do so and by doing that, you are able to feel true belonging. That our opinions, thoughts and reality can be YES and YES, rather than YES or… How do you stand up for what you believe to be true with civility? Found you on IG, love this author! Headed to get this book now. How does the discussion work? Hi Sara. How is the reading going? Have you had a chance to visit the reflection questions? 1. I had never really given it thought before reading the book to be honest. I’ve always struggled to fit into groups. When I reflect on my adolescence, early adulthood and adulthood I’ve never really fit in or felt like I’ve truly belonged. I had a really strong group of girlfriends in college, and it was the first time in my life I really felt like I belonged with a group of people. Our “ring leader” Andrea, had an amazing skill and ability to hold space for others and allow them to feel like they belong. 2. I’ve always felt welcome and like I belong with my family. I’ve had that foundation, so not belonging at school and with friend groups was hard, but I always could be safe at home. 3. What comes naturally to me is B- Boundaries and N – Non-judgement (ask for what you need and accept what others need without judging them). I struggle with, R – Reliability, A – Accountability. One of my biggest areas for growth is time management. I so often want to say yes to everything and end up letting people down by under delivering. 4. I practice spirituality through my yoga practice. My yoga practice reminds me to believe in myself, and truly belong with myself. As a yoga teacher, I teach people how to connect and hold space for their thoughts and others. 5. This is so hard. I’d love to hear what others think. I think I am behind a bit since I just recently started… I am about a third of the way through the book. Susan, you are not behind! You are right on track. We will reflect on the book as a community at the end of April. Subscribe to our newsletter to get an email when that blog post is live. Have you had a chance to reflect on the questions in this blog post? 1. I had never really given it thought. I know that I have struggled with the idea of always wanting to fit in, especially as a young girl. I know the pain of not fitting it. 3. Vault (keeping confidences and not speaking out of turn) is what I struggle with. It is hard to admit out loud. 4. I really enjoy gardening. It connects me to the earth, all living things and my spirituality. 5. I struggle with this in the workplace most. With friends, family and other relationships/situations it is easier to challenge the status quo or stand alone.. but at work, that is your livelihood at risk. If you upset the wrong person, or say the wrong thing… you could loose everything that you worked for and your house. I tend to play it really safe at work and just fly under the radar. Sorry Brene.